If the dear reader is anything like the gringa, you often take for granted amazing things, never wondering how they came about in the first place. Take lasers, for example. Most of us use lasers every day. There are laser toys for cats, laser printers and lasers used to heal people and to kill people. Although lasers are used for many purposes, they are all, essentially, the same thing: a focused beam of light or electromagnetic radiation. This beam is created by stimulating photon emissions from excited atoms. Next time you check out at the grocery store, just remember that bar code scanner is a very “excited” device! Many years ago one of the gringa’s loved ones had eye surgery. It was a laser that sliced and diced those very dear orbs. It never occurred to the gringa at the time to even wonder who should be thanked for this amazing technology that saved and improved my mother-in-law’s vision. Well, now I know and I’m going to share this incredible woman’s story. Dr. Patricia Bath has a lot of “firsts” on her resume. She was the first African American to complete an opthalmology residency. She was also the first female, African American doctor to have a medical patent. She got this for her invention that changed Mama’s eyes forever, the Laserphaco Probe. This device removed cataracts from the eyes of my caveman’s precious mother, enabling her to continue to see her children, grandchildren, great-grandchildren and do what she loves to do, sew, sew, sew. What is most amazing about Dr. Bath’s achievements is when she did them. She was born in Harlem, New York in 1942. That means she grew up and received her primary education more than 20 years before the Civil Rights Act was passed in the U.S. In an environment like that, what might have occurred to capture the attention of a little girl from Harlem and inspire her to become a doctor? Dr. Bath credits Dr. Albert Schweitzer’s service to lepers in the Congo along with the powerful influence of loving parents who fueled her own, personal empowerment engine. What kind of parents does it take to do this incredible service for their child? Were they superhuman? Educators? They were parents, period. Rupert Bath, Dr. Bath’s father, was a well-educated immigrant from Trinidad. He had a “first” to list in his own biography. He became the first black motorman employed by New York City’s subway system. He has an interesting background that includes writing newspaper columns and working as a merchant seaman which gave him the opportunity to travel all over the world. These experiences enabled a father to craft a legacy for his child that lasted a lifetime, the legacy of a broad mind. Dr. Bath’s mother, Gladys, encouraged her daughter to read, read, read. Books were a priority as well as a gift that soon became a favorite, a chemistry set. Gladys was an American of African slave and Cherokee ancestry and she was determined that her children (Dr. Bath had a brother) would have the best education possible. She scrubbed the floors of affluent New Yorkers to fund her children’s college dreams. Dr. Bath’s neighborhood was well-known for its poverty. However, for Bath, riches didn’t come in nickels and dimes, but in values, the love of family and the opportunity to grow through learning. And eventually, the medical world would become this little girl’s oyster through determination, belief in herself, and hours upon hours of dedication and hard work. As a young teenager, she showed such promise at a summer science program that two medical professionals doing cancer research took her under their wings, becoming her mentors. Her own research earned her an invitation to present her research at an international nutrition conference in Washington DC. This earned her a 1960 Merit Award and a bit of celebrity status, her achievement being reported in magazine and newspaper articles. It wouldn’t be until 1964 that Dr. Bath experienced studying under a black professor for the first time. It was a thrilling experience. She soon received a government fellowship which enabled her to participate in pediatrics medicine research in Yugoslavia. This was her first experience outside the U.S. and sparked a new interest in the medical needs of people throughout the world, especially the underprivileged. True to her principles, in 1968 she became coordinator for the Poor People’s Campaign that marched for economic rights in the nation’ capital. She would eventually shoulder the responsibility of the health and sanitary needs for the thousands who lived in the shantytown known as Resurrection City. Eventually, recognizing the vast differences in quality and accessibility of care between the “haves” and “have nots”, Dr. Bath convinced her professors to perform eye surgery on blind patients for free, she volunteering as assistant surgeon. Dr. Bath would continue her growth as a surgeon doing post-graduate work in cornea transplants. This would lead to the 1974 “first” previously mentioned, becoming the first female faculty member at UCLA’s Jules Stein Eye Institute. Despite this illustrious achievement, the office she was offered, in the basement with the lab animals, was seen as a slight. Dr. Bath stood up for herself and the institute quickly responded by giving her new office space more appropriate for her prestigious position. Nearly a decade later, 1983, Dr. Bath achieved another “first”. She became chair of UCLA’s Opthalmology Residency Training Program. As an American woman, she was the first to hold this position. Through Dr. Bath’s American Institute for the Prevention of Blindness, Americans everywhere can receive basic eye care regardless of how poor they may be. Throughout the world newborns have their eyesight protected with medication provided by the institute that prevents common infections. Malnourished children in every country have access to vitamin A supplements to protect their eyes from damage caused by lack of proper nutrition. Vaccinations for infectious diseases known to cause blindness are also made available to vulnerable populations around the world. When Dr. Bath sought to create a device to make cataract removal surgery less invasive and more precise, her colleagues told her it couldn’t be done. But she showed them, didn’t she! Her scope was not just patented in the US, but also in Japan, Canada and five European countries. Even after Dr. Bath retired, she was still achieving historical “firsts”. In 1993 she became the first woman to be elected to UCLA Medical Center’s honorary medical staff. And throughout her retirement, her passion to prevent blindness has never ceased. Perhaps it is a fire that will never die, fueled by the amazing experience of restoring sight to a North African woman who had been blind for 30 years. This was the philosophy behind her creation of the American Institute for the Prevention of Blindness in 1976. Ten years later she revealed to the world the goods on her philosophy, the Laserphaco Probe. Officially patented in 1988, Dr. Bath became the first African American female doctor to receive a medical patent. The world needs so many scientists to solve the problems facing the world today. Compassion driven science can change the world for the better, making every day a better day than the one before. The gringa says, “Thank you” to all the Dr. Bath’s in the world. We need more of you! Posted on March 20, 2017 March 9, 2017 Categories Civil Rights, Education, healthcare, History, Homeschool, Medicine, school, Science, technology, Uncategorized, women's rightsTags blindness, Education, eyesight, gringa, invent, laser, medicine, opthalmology, science, technology1 Comment on Who MADE That? Has the gringa’s dear readers viewed the video depicting the future of clothing? Interactive clothing designed by Behnaz Farahi, called “Caress of the Gaze”, is the most erotically fascinating thing the gringa believes she has ever seen where the latest technology is concerned. I was mesmerized. Created from a “semi-flexible mesh” that is interlaced with “muscle wire”, the fabric’s responsive movement is controlled by a hidden camera that detects where observers are focusing their gaze. For young lovers of technology who happen to be fashion divas, it seems that the future of fashion design will also require strength in STEM studies. As cool as this is, what purpose could such clothing actually do other than make for a real hot date experience? Gender recognition is one future purpose. Scientists who study evolutionary markers in humans theorize that eventually Earthlings will evolve to an androgynous, gender neutral appearance. Clothing, then, might help romantic hopefuls identify the gender of promising prospects. Post-genderism is a social, as well as a political, movement. Women discovered long ago that masculinizing (is that even a word?) their appearance was necessary to challenge issues of equality. As gender based inequality became a subject of scholarly studies and society has become more aware and inclusive of people with different ideas of gender altogether, evolving to a society where gender is removed from the appearance of humans seems to be the trend. Since 2014 the fashion industry has actively been generating ambisexual clothing lines that are appealing to a generation of Earthlings who don’t care if a person is male or female, or considers themselves both or neither. 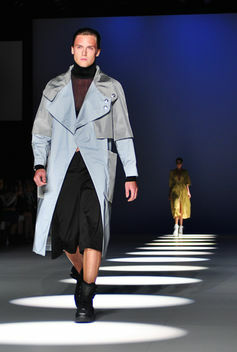 Post-gender fashion means that men wearing skirts (not just kilts) is just as acceptable as women wearing pants. Truly, that is equality. Women have been screaming about equality for decades. Women have demanded to be able to wear pants if we want. The pantsuit is the icon of power executive wear for women. Now it is time to stop practicing a double standard and let men wear skirts with dignity. In addition to helping a post-gender society recognize who is what, the fabric could also be adapted for defense purposes. The gringa hates the reality that there will always be those who take anything that is developed for social good and finds a way to make a more efficient method of killing people. But, face it folks, minds like that are not going away anytime soon. The gringa finds it highly likely for technology such as this to be further developed to create clothing that can be used by military folk and law enforcement personnel to cloak soldiers and agents, helping them blend in and become virtually invisible to the eyes of their opponents. Who knows, some unsuspecting counterfeiter may not notice that sitting in a quiet corner of his room is an FBI agent in the deepest cover imaginable. It could create a whole new meaning to the phrase “undercover agent”. The gringa just wants to have an interesting date night with the caveman. I would like one hot mess of a dress made out of this fabric. The gringa would much rather make love, not war. For the most part, up until the year 1922 in American history, women were rarely mentioned in immigration legislation, except for the Act of 1875. That year Congress dealt with the Chinese prostitution issue. United States culture of the eighteenth and nineteenth centuries considered women under the identity of their husband. It was presumed that any woman would eventually marry and her identity would be tied to her husband. The result of this attitude was a 1907 immigration law requiring women assume the nationality and citizenship status of their husbands upon marriage. This meant that even women born on U.S. soil who married a non-U.S. citizen lost their United States citizenship status. If her husband’s country of origin was involved in a war with the U.S., she may be considered an “enemy alien” and stripped of property and her employment. This happened to scores of women who were married to German and Italian born men when the country entered World War I. Around $25 million in property nationwide was confiscated by the U.S. Although women may not have felt this was fair and desired to have control of their own identity, there wasn’t anything they could do about it until the law changed. There were some legally savvy women who managed to circumvent this technicality and also obtain their own personal property by way of the Homestead Act, thus maintaining their legal status of U.S. citizen even though they married a foreign born husband. However, not every woman was successful choosing this route. The reality for women in the early history of America was that society discriminated against women in general, and even more harshly discriminated against white women who married another race. If the gringa had faced this national attitude after meeting her Peruvian caveman, she would have gladly traded her country for her man. Prior to 1907, there was no specific legal language written into immigration laws regarding women. Immigrating women then could only hope in their case being handled by a sympathetic court because each court applied their own interpretation of current immigration laws. From 1790 until 1802 immigration laws specified “free white persons” as having the right to the naturalization process without gender determination. It was the social practice of that time to interpret “persons” as being male and this male represented the females of his household. The only women specifically mentioned by immigration laws were the widows of men who had qualified and applied for citizenship but died before the process was complete or foreign born women who became citizens when they married American men. On August 18, 1920, the power of the women’s suffrage movement resulted in the ratification of the Nineteenth Amendment to the U.S. Constitution which gave women the right to vote. It is no coincidence that within two years of this event politicians realized they were going to have to listen to the voices of half the country’s constituents. The Married Women’s Act of 1922 (also known as the Cable Act, the Married Women’s Independent Citizenship Act or the Married Women’s Independent Nationality Act) is the second monument to the empowerment of women of that generation. Section three stated, “That a woman citizen of the United States shall not cease to be a citizen of the United States by reason of her marriage after the passage of this Act, unless she makes a formal renunciation of her citizenship.” A woman who had lost her citizenship status from 1907 until 1922, because of marriage to a foreign man, could apply for naturalization. The only exception was if they married a man who was ineligible for American citizenship because of his race, such as Chinese, Japanese, or Filipino. However, nine years later, on March 3, 1931, an amendment allowed these women to finally maintain their U.S. citizenship status. At last, women were a recognized class of American citizens in their own right. Prior to 1920, a woman’s citizenship status was not considered important because they could not vote and any property they owned became their husband’s. This was the legal practice of “coverture”, a British legal principle imported with the founding fathers. The Nineteenth Amendment changed that. In order to vote, a woman had to be a citizen. It was now more important than ever that a woman retain her individual identity no matter who she chose to marry. Legislators who wanted or needed the female vote were going to have to respond with legislation to protect the citizenship status of their electorate. Again, we see immigration reform motivated not by the minds of lawmakers opening and maturing with a new-found respect for a woman’s right to be treated equal but rather by the desire to maintain power by pandering to a class of people who will respond to their actions favorably and give them their votes. So, in 1922 legislators gave this newly empowered voting class what they wanted. A woman’s nationality was her own with naturalization terms equal to that of men. The United States had come a long way from the society of our founding fathers. The dreams of the wives of those founding fathers had finally come true. In 1876, in a letter Abigail Adams wrote to her husband, President John Adams, she stated, “I cannot say that I think you are very generous to the ladies; for, whilst you are proclaiming peace and good-will to men, emancipating all nations, you insist upon retaining an absolute power over wives.” Even earlier than Abigail Adam’s letter, in 1790, Judith Sargent Murray, an American poet and advocate for women’s rights, wrote “men generate inequality and formulate rules of society for their own benefit with no regard for women’s needs”. Once again the true history of the United States reveals a nation originally designed to be a male dominated, capitalist society, preserving the racial superiority of the white majority and serving national and international economic and political interests rather than the needs of the women and non-white races within the country. None of this surprises the gringa.